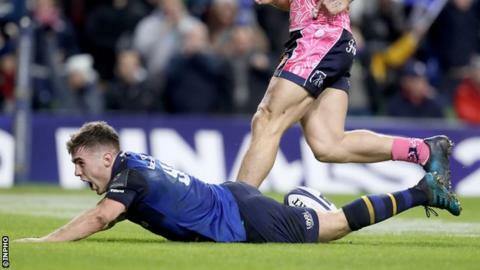 Leinster moved closer to a European Champions Cup quarter-final spot after coming from 14 points down to complete back-to-back wins over Exeter Chiefs. Tries by Sam Skinner and Luke Cowan-Dickie gave Chiefs a deserved half-time lead after Leinster fly-half Johnny Sexton suffered an early head injury. The hosts rallied in the second half and Luke McGrath's try put them five points clear at the top of Pool Three. Exeter slip to third in the table after Montpellier had earlier beaten Glasgow. Stung from the loss of their year-long unbeaten home record, Exeter made a blistering start in Dublin. The visitors exploited an early penalty to claim a foothold in Leinster territory and Skinner trundled over for the opening try with just four minutes on the clock. In a further blow for Leinster, Sexton suffered a knock to the head in the build-up to Skinner's try and the Ireland and Lions fly-half was forced off the field. Isa Nacewa took over the goal-kicking duties for Leinster and he converted a 12th-minute penalty to put the hosts on the scoreboard. After Gareth Steenson had cancelled out that score, Exeter's second try pushed them into a 14-point lead when Cowan-Dickie was at the tail of an unstoppable lineout maul. Nacewa added two more penalties in the final minutes of the first half to close the gap to eight points at half-time. A rejuvenated Leinster took control in the second-half and Nacewa kicked a further two penalties to cut Exeter's lead to just two points before the home side pounced for the decisive score of the match in the 66th minute. Replacement flanker Dan Leavy made a muscular break before he was able to off-load to McGrath and the scrum-half scored under the posts to push Leinster into the lead for the first time. The Chiefs staged a desperate late surge to try and regain the lead but they were unable to breach the Leinster defence for a third time as they had to settle for a losing bonus point. The victory for Leinster was the first time they have won their opening four pool games in Europe since 2004 and they will hope to wrap-up the battle for the top spot in Pool Three when they play Glasgow Warriors at the RDS in round five, while Exeter will attempt to regain second place when they host Montpellier. The final round of pool games will see Glasgow take on the Chiefs at Scotstoun, while Leinster will travel to the south of France to face Montpellier. Leinster: R Kearney; F McFadden, G Ringrose, R Henshaw, I Nacewa (capt); J Sexton, L McGrath; C Healy, S Cronin, T Furlong, D Toner, S Fardy, S O'Brien, J van der Flier, J Conan. Replacements: J Tracey for S Cronin (56), J McGrath for C Healy (56), A Porter for T Furlong (74), J Ryan for D Toner (56), D Leavy for S O'Brien (56), J Gibson-Park for L McGrath (74), R Byrne for J Sexton (4), J Larmour HIA for R Byrne (6). Exeter Chiefs: L Turner; J Nowell, H Slade, I Whitten, O Woodburn; G Steenson (capt), N White; B Moon, L Cowan-Dickie, T Francis, M Lees, S Skinner, D Armand, M Kvesic, S Simmonds. Replacements: J Yeandle for L Cowan-Dickie (65), A Hepburn for B Moon (56), H Williams for T Francis (52), J Hill for M Lees (60), T Waldrom for M Kvesic (68), W Chudley for N White (63), S Hill for I Whitten (64), J Short for L Turner (74).